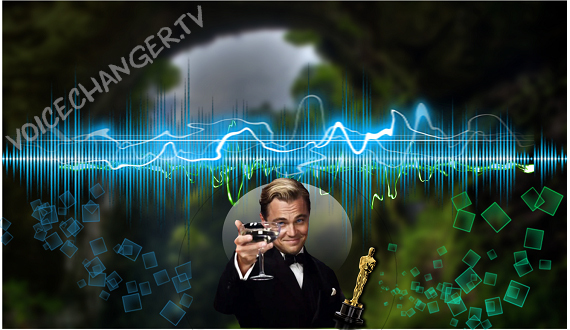 A great voice needs great Background Effects, just like Leonardo Dicaprio deserves the Oscar. 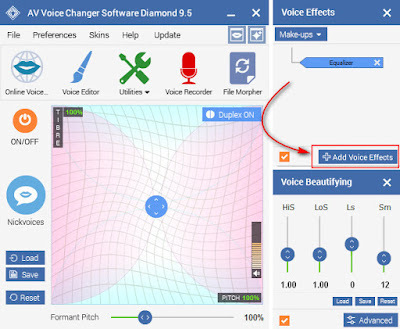 Using Voice Changer to modify your voice is cool, but your calls will be even more unique and realistic with the background sounds. Talking in creepy voice on Halloween night with no background effects is like a dull sword which cannot cut. A great voice needs great support, just like Leonardo Dicaprio deserves the Oscar. 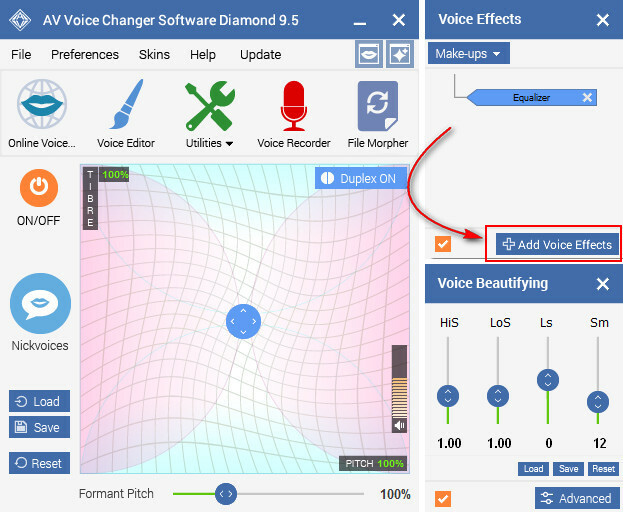 With just a few simple steps, you can apply different background effects into your audio files or conversation, making them more lively and special. 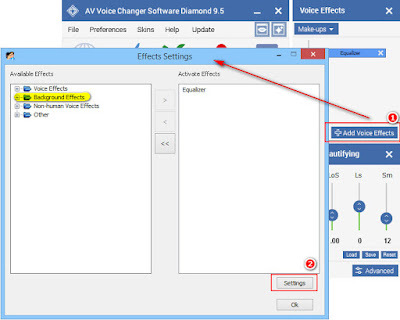 In this tutorial you will learn how to apply background effects in AV Voice Changer Software Diamond 9.5 (VCSD 9.5). There are three ways to add background effects and each has its own advantages. This is the easiest and quickest way to "sharpen your sword". 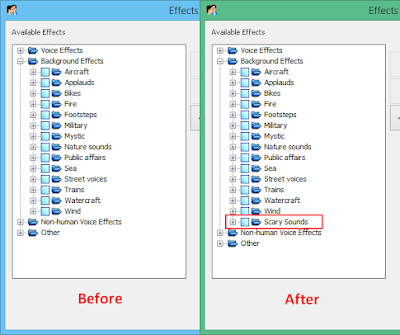 You can choose various effects from the built-in library. 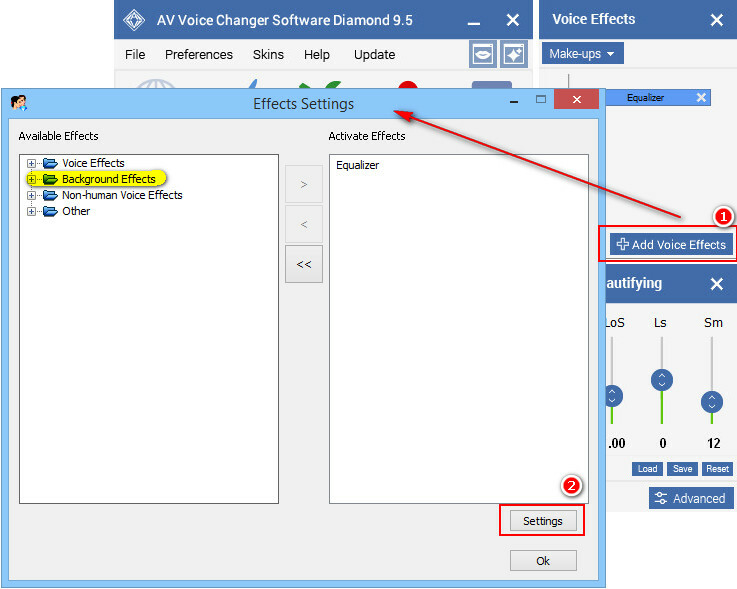 - Click Add Voice Effects icon to open Effects Settings dialog box. - In Effects Settings dialog box, choose any effects from Background Effects drop-down list and enjoy the result. Note: Remember to turn on the effects to activate them in your calls. The icon will turn to yellow when it is ON. - You can come to the Add-on Store to download the background effect packs you want. Note: Remember to choose the packs used for VCSD9. The others which applied for other products cannot be used for VCSD9. - Double click on the downloaded exe file and follow the instruction to install. 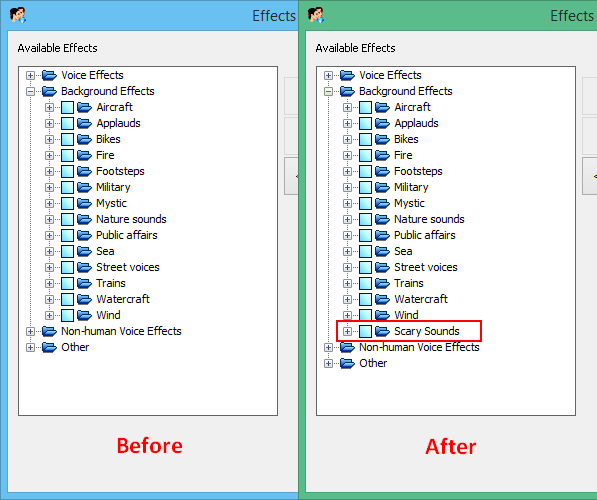 In this example, we will use the free add-on Scary Sound background effect. You can see the difference after the installation in the picture below. 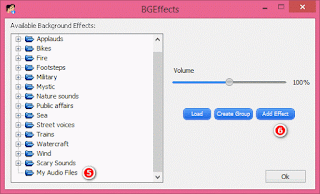 - Open Effects Settings dialog box. - Expand the Background Effects list. - Select the newly installed background effects and enjoy. What is great about VCSD9 is that you can use any audio files, even your own songs, screams or your audio projects as the background effects. 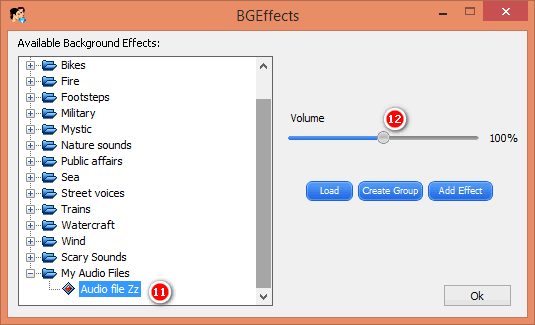 - Click on Background Effects list to enable Settings button and click on it (2). Note: The Settings button is only clickable when you click on Background Effects. 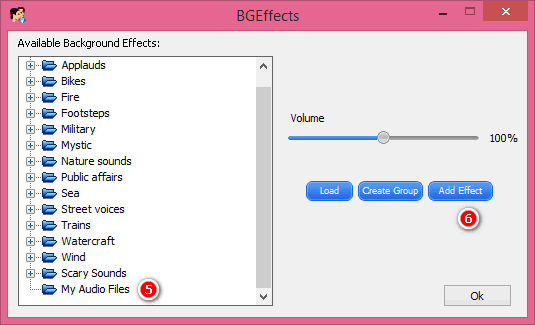 - You will see the BGEffects dialog box. - Click the Create Group button (3) to add a new group. - The Create a new group dialog box appears, type the group name into the Title textbox (4), then click OK to finish and close this dialog box. - The new group will be listed at the end of the Background Effect Tree (5). 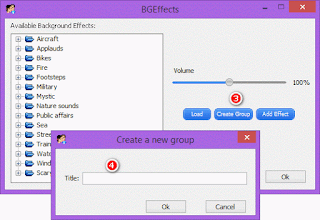 - Select from the Group drop-down list (7) the group you want to place the new effect in. - Type the name of the new effect into the Description field (8). 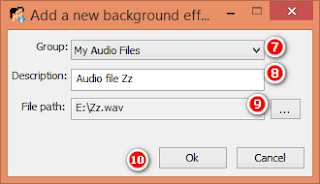 - Specify the audio file that will be added as the new background effect using the Browse button (9). Click OK button (10) to finish and close the dialog box. - To choose an effect in a group, expand the group by double clicking the group name, then check the check box of the effect name (11). Click OK, the background effect will be applied right away. - Tip: You can change the volume of the background effect by adjusting the Volume slider (12). - Note: The Load button is used for fast set-up, but it will not save your new effect.